A stunning design of Grey’s Monument in Newcastle Upon Tyne. By talented artist, Dave Thompson. Thompson’s art revisits a classic era of poster design, taking many elements of popular 1950’s travel art, while remaining current and vibrant. 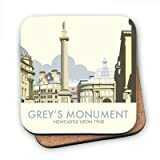 This entry was posted in Luggage and tagged 100mm, Art247, Backed, Coaster, Cork, Dave, Design, Grey's, Illustrator, Monument, Newcastle, Thompson, Tyne, Upon by Perfect Vacation. Bookmark the permalink.